Autumn: it’s time again to walk the long good-bye among the fallen leaves and the last flowers of summer and think about Keats’ ‘Ode to Autumn,’ a poem I cannot forget. For a number of years on an especially fine October day I would take my Writing as a Naturalist class at Ithaca College outside. We would read Keats’ poem aloud together and then I would ask them to choose their favorite line. Though many students of the 21st century seem to be occasionally more interested in science fiction and epic fantasy, they responded wholeheartedly to this classic Romantic poem. It never failed to awaken their notice and appreciation of the day and the season. Every line had a champion. Keats’ “Autumn” has been called by some the most perfect poem in the English language, and many readers and critics have observed that it is a celebration of our ecosystem and interconnectedness. Which is perhaps the reason for its perfection, in that its many references to nonhuman species awaken a remembrance of how our own biology connects us to all the fruits and birds and insects and weather of the Earth. We feel nourished after reading the poem, more aware of the blessings of harvest. Keats composed the poem, in 1819, two years before his death. 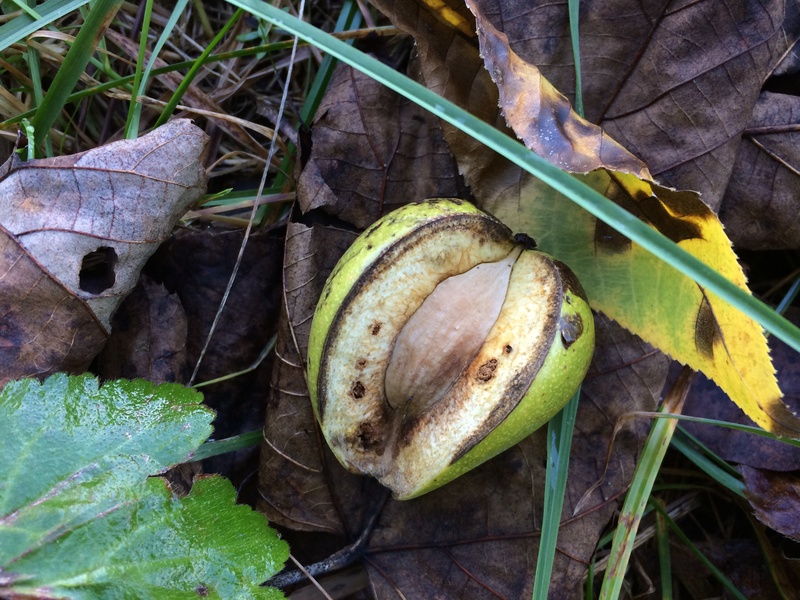 Scholar Jonathan Bate writes in his essay “The Ode ‘To Autumn’ as Ecosystem” that when doctors in Rome opened up his body after death “they thought it was the worst possible Consumption—the lungs were intirely destroyed—the cells were quite gone’” (p. 258 in The Green Studies Reader: From Romanticism to Ecocriticism). Keats died when he was 26. 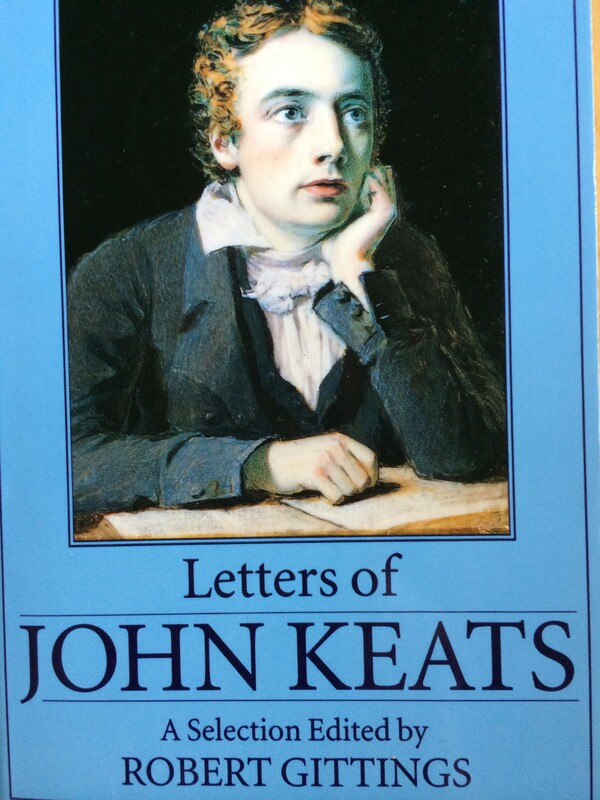 My copy of Keats’ Letters. … the poem itself is an image of ecological wholeness which may grant to the attentive and receptive reader a sense of being-at-home-in-the-world….the movement through the poem…is not one which divides the culture from the nature. There is no sense of river, hill, and sky as the opposite of house and garden. Rather, what Keats seems to be saying is that to achieve being-at-home-in-the-world you have to begin from your own dwelling-place. Think globally, act locally…. Bates sees the “thee” in the poem as thoroughly female, and I have always imagined the person with “soft-lifted hair” as a woman, though much older than Winslow Homer’s “Autumn,” but perhaps with red hair as well, while Carol Rumens in her rumination on the poem, which she writes is “marked by sensuous profusion and artistic control,” sees a male Dionysian figure becoming at some points androgynous. The students always end our Keats’ Autumn class talking about how they love Ithaca’s Apple Festival and drinking cider and eating apple cider donuts, where they connect with farmers and growers and craftspeople, many distant from academic circles the rest of the year, through the sharing of harvest. 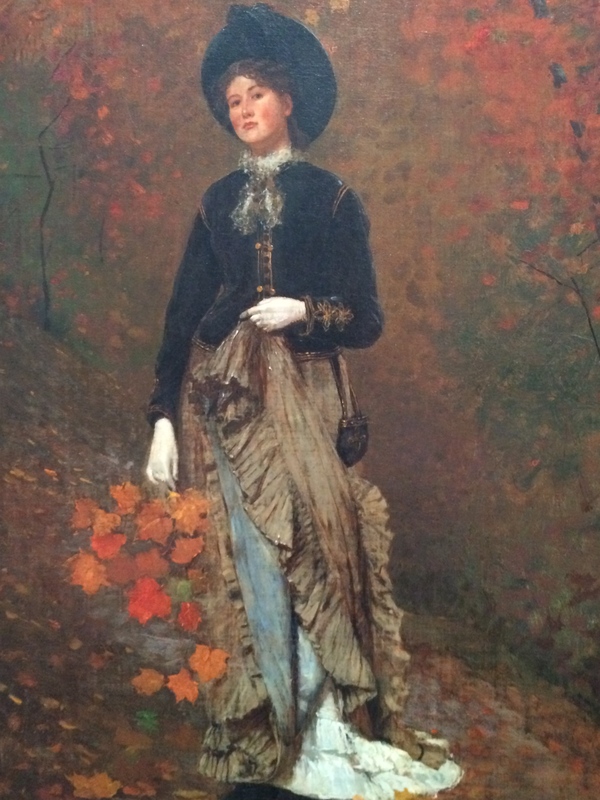 Winslow Homer’s “Autumn” seen at the National Gallery in Washington, D.C. a few weeks ago. I also walk in autumn, saying a good-bye to the ecosystem before its winter’s nap. Devoid of the kind of “artistic control” that Keats possessed, I wish to include here all that I see. 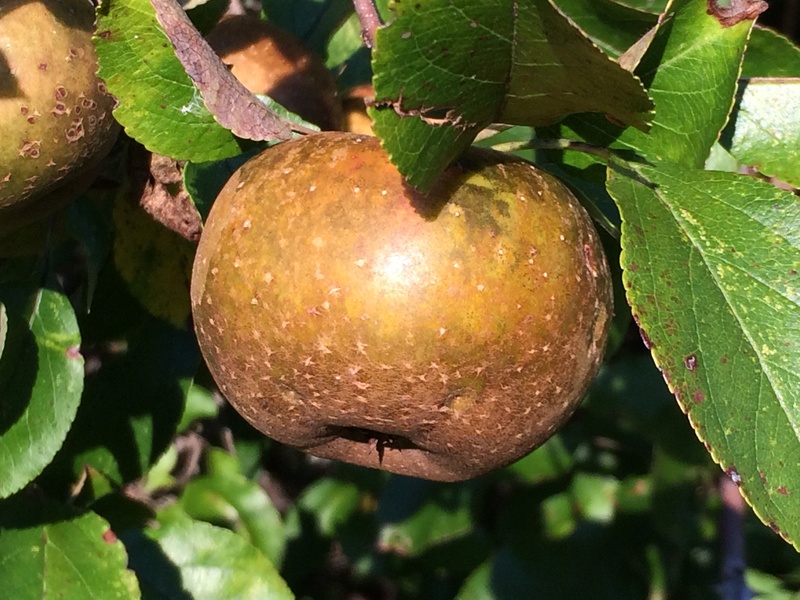 Wild apple (Enfield, Ithaca, NY). So delicious! Autumn crocus and myrtle. 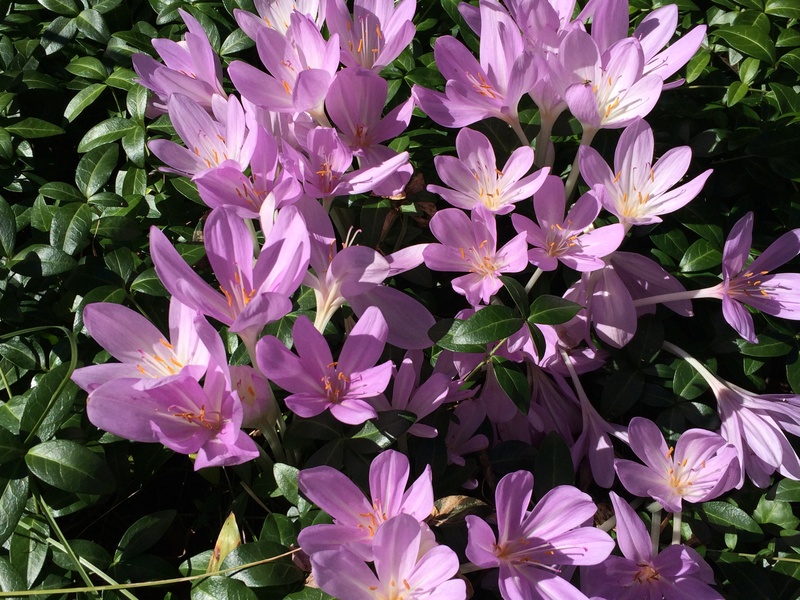 The large (some call them ungainly) leaves of the autumn crocus (Colchicum autumnale) appear in the spring. 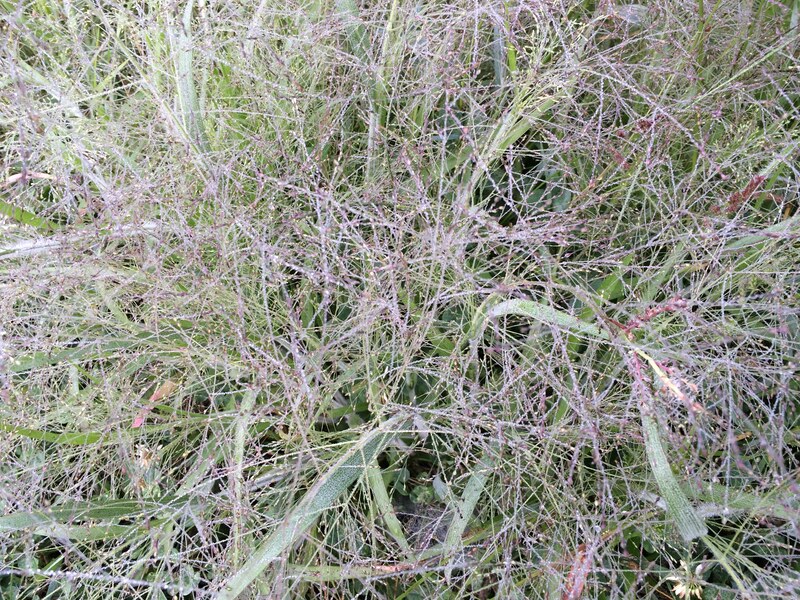 After the leaves have died down, and much later the flowers appear in the fall. 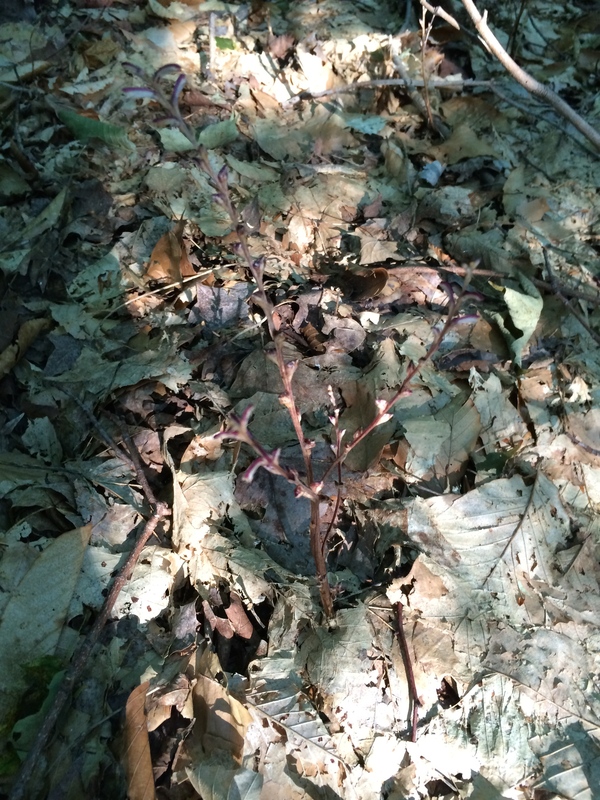 Beechdrop (a parasitic plant, Epifagus virginiana) arising out of leaf litter. It carpets the forest floor at this time of year in Enfield, NY. 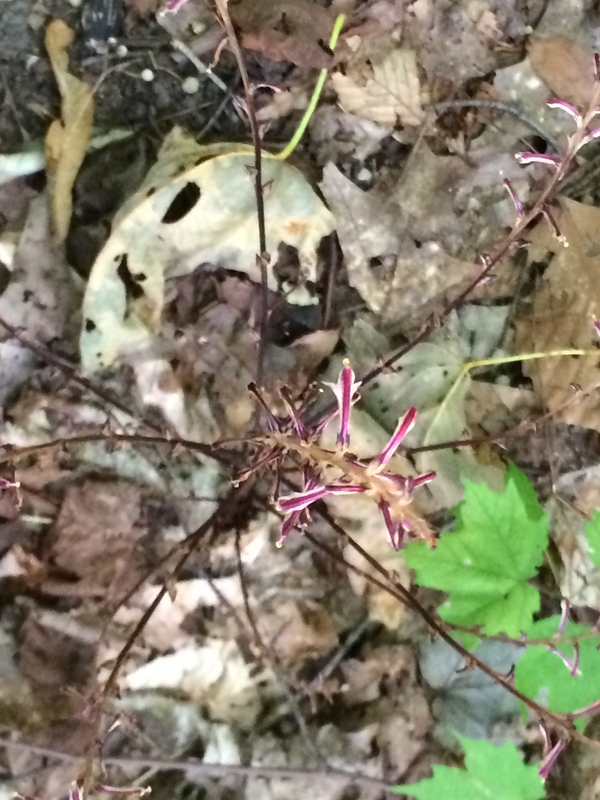 A view looking down at the whorled form of a beechdrop, showing the reddish purple flower. The beechdrop lacks chlorophyll and so must gain its sustenance from the roots of beech trees. 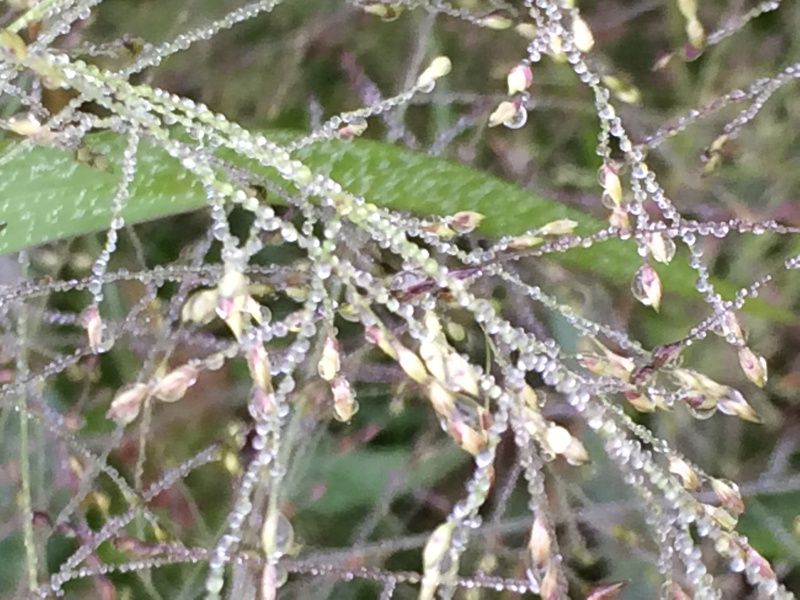 Dewdrops find the fine hairs of these soft grasses. 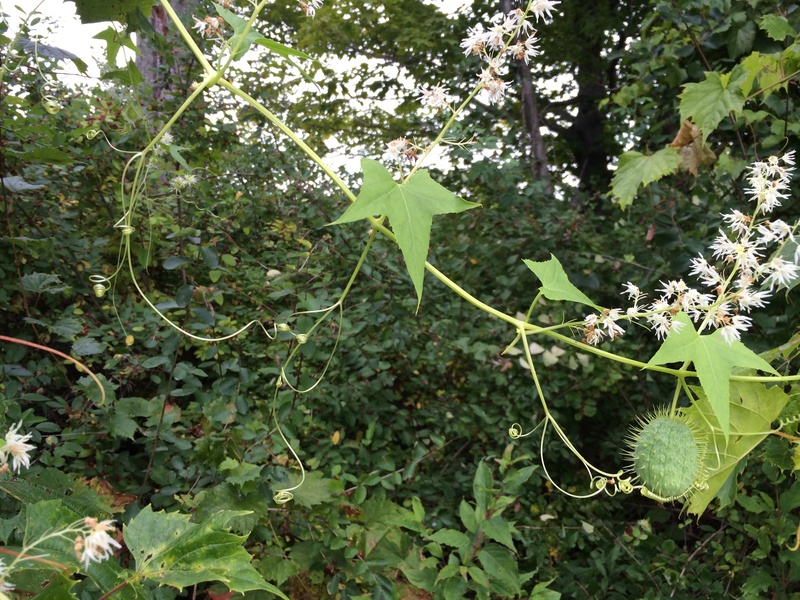 Bur cucumber: flowers, fruit, and tendrils. Where is the bird now who nested here in the spring? 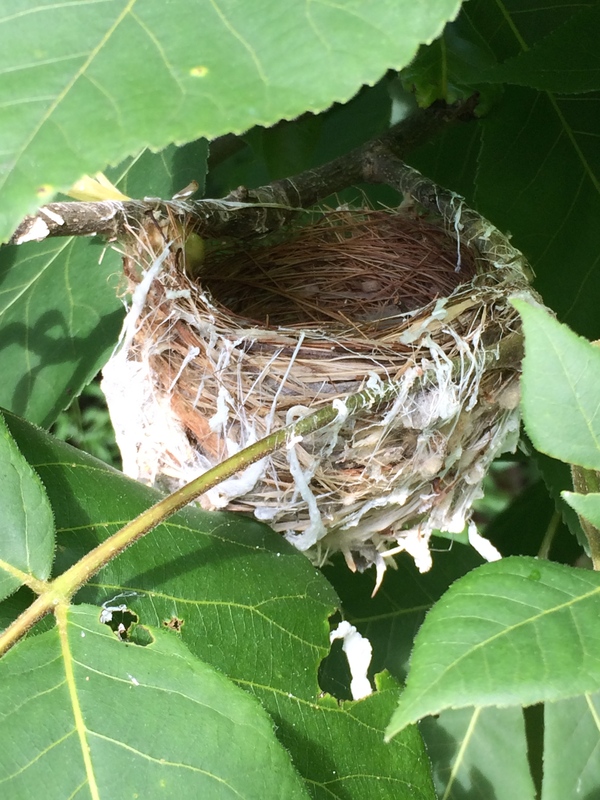 An empty nest dangles in my path. Apple and bees or are they wasps that look like bees? I must consult my cousin for an identification. 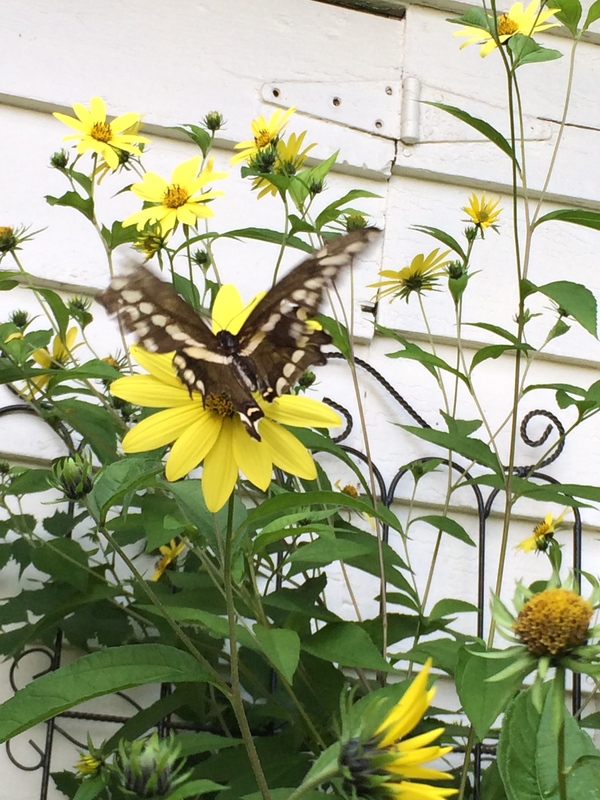 Helianthus (perennial sunflower) and butterfly. Horse browsing in Keats’ “mellow mists” (Enfield, NY). The only descriptive word Keats repeats in the poem is “soft” as in “thy hair soft-lifted” and “soft-dying day.” He’s right. When the sun shines, autumn days are so soft, because some mists are warm. 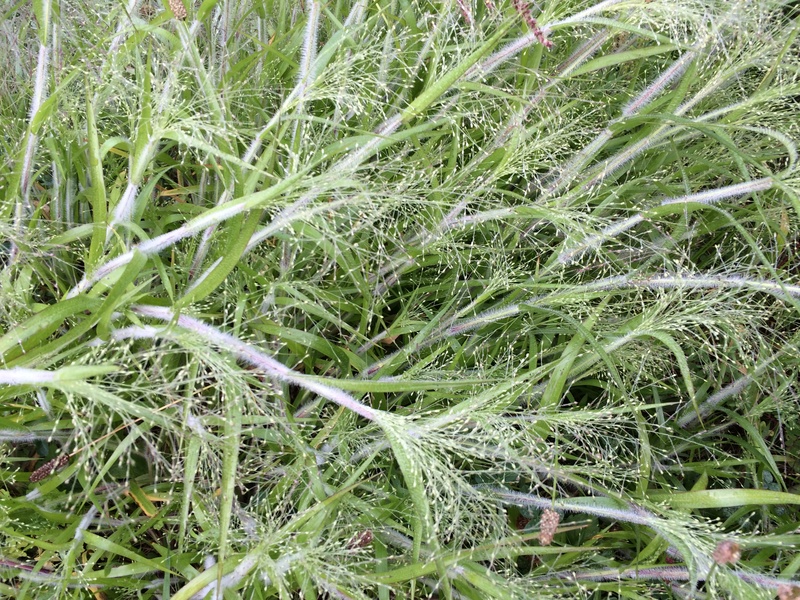 My favorite line is “Then in a wailful choir the small gnats mourn.” It’s a line that is both romantic and unromantic. I find it moving that Keats gives the burden and honor of mourning, the short good-bye because gnats do not live very long, to the insignificant gnat. Every day that I walk I find new autumn stories. 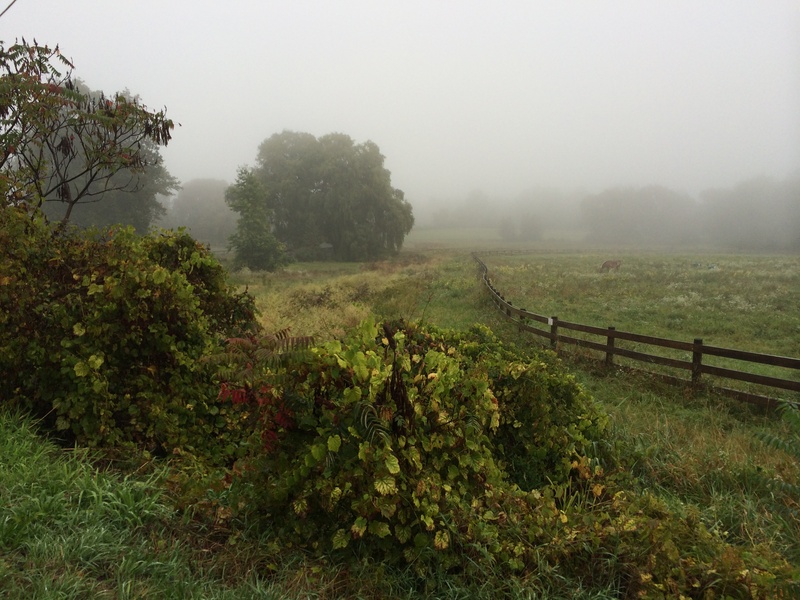 The hedgerows of my husband’s tree nursery are blessed with hickories–particularly shagbark hickories. The nuts cause my feet to bobble. Soon I pick up the offending spheres, sniff them, and put them in my pocket for further aromatherapy. 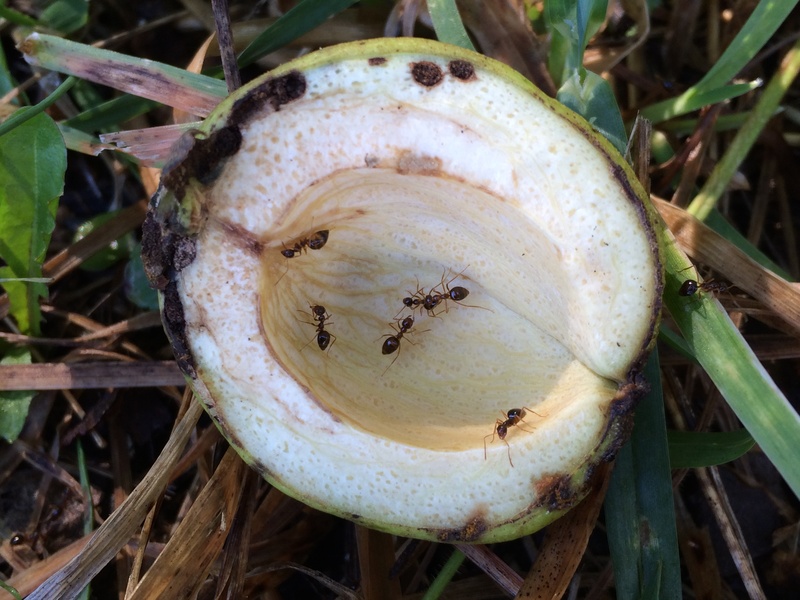 Sometimes I see an ecosystem story, like this one about the hickories and ants. A shagbark hickory awaiting an herbivore caught my attention. 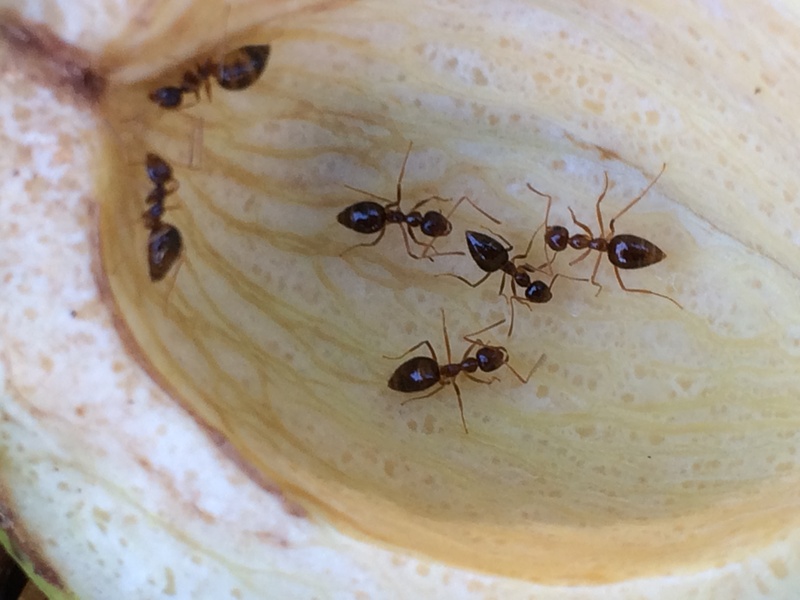 Ants investigate the inside of a hickory shell. 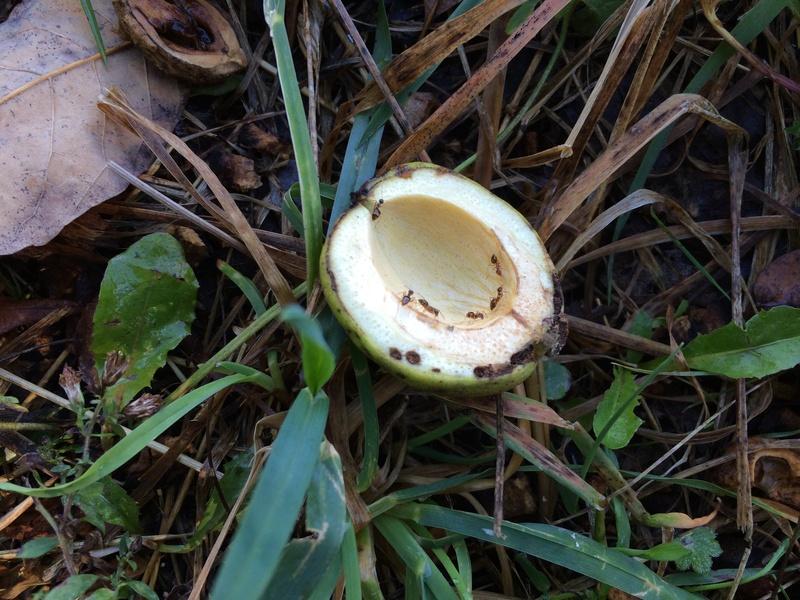 Ants in close contact as they explore the inside of the shell. I am sure this is a story that E. O. Wilson, the great ant biologist, could decipher, or perhaps Darwin had notes on such an interaction because he observed almost everything. 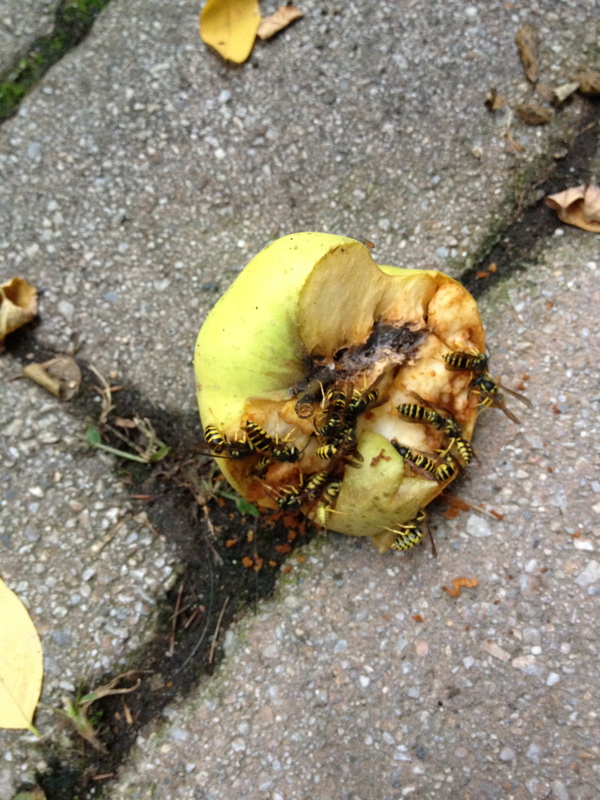 It seems that Autumn is a time when members of an Ecosystem exhibit their last behaviors of interconnectedness before the Big Rest. 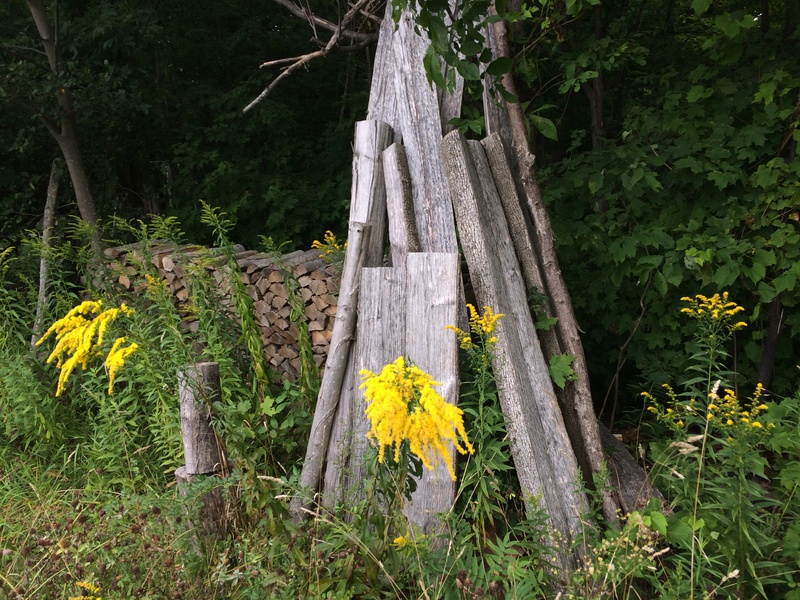 The golden and the grey: goldenrod ornamenting woodpile constructed by busy human.